The entertaining idea that natural history could be endlessly presented to the public by poets the world over, a gorgeous premise for this particular collection. Such an attractive floral fresh cover, then innovative presentation around the poems features various editing side-notes, and a whole other linked story revealed. Some odd moments to chuckle over, and different realms of meaning. Painter has in this one collection told us varied, (at times scandalous), details may exist in margins, details about poets and their editors having far too much to do with each other. Also hinting that a poet’s place in the world could prove far broader than anyone may usually imagine, and too, Painter introduces random facts about various places and occurrences. Readers could find themselves diverted and somewhat informed. and then dinner at the Hand & Flowers. This start of one poem, above, from early on, a glimpse of the tone of the whole piece. It’s followed by quite a different offering. Excerpts from a Natural History did take some getting into, due to my own dislike of editing software and terse little boxes to the side of a manuscript. I favour hand-written editing notes. But after a short while the editor being rather less than professional in their behaviour seemed so unlikely but hilarious, I couldn’t help feeling drawn in, o and all those different layers of meaning. Not simply a collection about overlapping worlds, gathering knowledge, a love affair, or heart-break, and intrusion, it’s also about what happens when we see behind the scenes, how people attracted to each other may allow feelings to affect so much, and the extraordinary power of language to convey volumes in so few words. Co-incidentally, the natural history of a love affair is revealed along with facts regarding more usual histories re such subjects as Grade I Listed Buildings, or the Regenerative Properties of Asteroidean Echinoderms, and Areas of Outstanding Beauty… along with many other quite different often curious topics. Gradually the two separate projects, if we may call love notes such, mingle and overlap. Professionalism and academic pursuits appear highlighted, the need for what we may call ‘being objective’, and ‘not talking about ourselves at work.’ This theme wafts and meanders, initially, through this fine collection like perfume in a room, or an indistinct entertaining music, with various surprises. Tone and mood gradually change however, so the mysterious scent or sense of it is quite something else, even alarming, but always darkly attractive. Who dares carry on a clandestine affair with a poet? Anyone could ask just that after reading this startling collection. Editor’s notes outline a hidden story, revealed to the reader in what we could decide is a kind of literary revenge. If in fact this relationship did blossom to affect the work, then turn into something possibly scary, surely it would mean the ultimate ‘so there’ to publish all the material for anyone to see? Amusing, with quite a few shocks and twists. You may laugh out loud like I did. Painter’s a masterful writer, managing the gradual diverting changes in this collection extremely well. The sub-plot of an affair between the editor and poet appears reasonably realistic. Also, poetic interpretations of hugely varied natural histories, even without the side-notes stand as elegant, or distinctive poems. Eventually both themes become one, too, seamlessly. A great deal of satisfying content, well arranged, and truly an adventure to read. In fact you may like the idea of reading the poems alone, first, then the side-notes alone, then the two together. Some readers may be tempted to write their own commentary. Maybe the poet more obviously demands critique from us, by showing the kind of editorial commentary poets may usually, (and also almost never), see? Excerpts from a Natural History certainly inspires thinking about ways we may present writing, with what formats, comments, foot-notes, disguises and language. This work is as much about the actual concrete subjects as about what poetry truly is, or may be, and how we can change or stretch the form, try innovative ideas, shape language as we please to gather a new or more excited readership. It’s a beautiful, clever illustration too, showing the natural history of the literary community has a wealth of narrative going on at any time. In this case readers get a glimpse of the kind of politics writers and their ilk may live with, every day, albeit exaggerated, or is it? Painter’s language, as mentioned, pleases in itself. “ …peeled back like a Christmas bulb/ or Cinderella’s pumpkin carriage” or “Acres of anxious Angelinos/ whine their horns at the five o’clock symphony.” or “Guard tourism and history with vigilant defense.” The latter having an ironic if somewhat pompous humour about it, too. This being the 392nd year of research, there’s ample reason for an extraordinary range of subjects, such as, the imaginary unit, buttons for sale in a hospice shop, flower varieties sold at an airport, an email spam folder’s contents (which appears to have not been ever assigned, but is included), a Detroit poetry reading, and departing flights noted from a classroom during a course about trucking…. This range of focus then too provides ready opportunities to introduce romantic red herrings, and outright cheek. What a wide scope Painter covers within the confines of a poet’s reports and an editor’s commentary, also showing their growing mutual attraction, and what happened next to the work, and themselves. Do enjoy this. 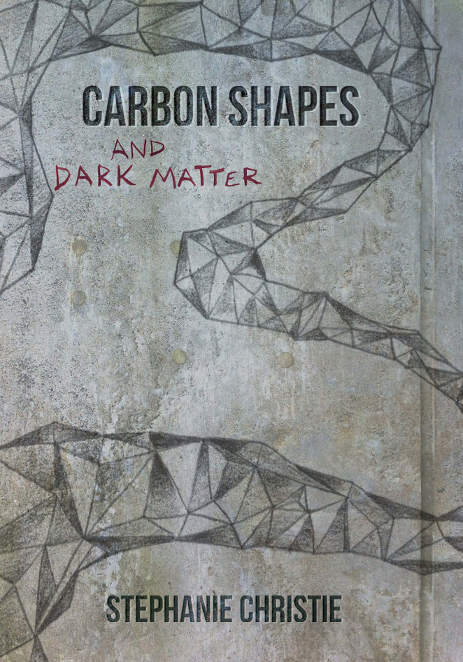 The title comes from a line in one of Christie’s trickier poems, “Look inside the things we know/ to carbon shapes and dark matter/ maintaining the flash flood of her smile.” This verse appears on the back cover. Perhaps a reader understands this is not as straightforwardly complex as one may think, from simply reading the collection’s title. These poems do quite a few twisty turns. Christie explains life lately without directly mentioning too many dire, broad world concerns, but instead takes those as an atmosphere. She then shows what contemporary life may not easily address day-to-day, (making visible her desires), or discusses what occupies her days, (watching others, discussions, feelings about infringements, shelves in a mall and cleaners there)…. We see too how she intensifies attention, wishes for better, maintains dialogue… and what springs to mind therefore. Profound ideas surrounded or held with the most charming, simple, believable imagery. Statements strike a reader then with more clarity and resonance. In fields and areas of what Christie makes us see or smell or hear etc., abstract ideas appear as if we’ve thought of them ourselves in our daily life. How excellently the poem Clod, page 27 races about rather randomly through so many situations, as one person addresses the other about tasks and events. The mundane, (“we’ve grown up and can pay good rent”), the ridiculous, ( a moon shrieking), the difficult, ( growing unstuck and turning bad or attracting it), the contradictions, (“Do not follow any instructions./ Hold me”), the worthy, (“…keeping out/ of power’s way,”) then stating with delicate sureness something that may give anyone genuine strength, and hope. each moment as it comes. A sense of trying to find language to explain away impossible awfulness and worries, with too surely a growing need to stay loving, aware, as the measure of what’s best, emerges. Christie debunks naysayers by saying a conspiracy is not necessary for this mess to exist, and explains our current crisis world-wide as if she’s watching ink fall into clean water and changing it, blooming. So much stated with so few words, and massive shifts without seeming to have done much at all, rather like watching a dance by someone truly athletic and artful. In some ways this collection represents a manual for surviving our difficult present moments, like the title suggests, with a scientific clarity to much of it. In the poem, Crossing the Park, page 8, Christie clearly and somewhat happily at first, describes various young people someone could meet. The kids are classified according to how dangerous they seem to be, and the poem ends with a play on punctuation, which lightens its otherwise grim assertion. …it’s wise to be scared of. Christie brings a sharp intelligence to her writing, softened at times by a genuine playfulness with language, as if mere meaning is not as important as enjoying oneself. Then, also insights reveal valuable ideas, presented in myriad ways. Perhaps occasionally somewhat chaotic arrangements of introverted lines may not always serve the poem well, when the subject appears worried, but rarely does that happen. A certain grace and care is evident usually, along with admirable originality and clarity. The fact that Christie has also bravely addressed many topics which a number of people could find impossible or extremely difficult to discuss, has to be seen as one of the main strengths of this collection. Poetry allows us to find our way indeed to the drives and mysteries behind such simple gestures as a smile, or why someone could find washing their car a time to pause for thought. Christie presents a fine collection here, and I trust many readers enjoy it. Long ago amongst the more daring edges of Poetry Live Auckland, where words appear reinvented, I heard Olivia Macassey read her eloquent, mysterious, often amusing poetry and felt so impressed. Her poetry’s been published in Poetry New Zealand, Brief, Magazine, Tongue in Your Ear, Blackmail Press, in student publications, and on the CD Aural Ink. Her first poetry collection, Love in the Age of Mechanical Reproduction, was published by Titus, 2005. 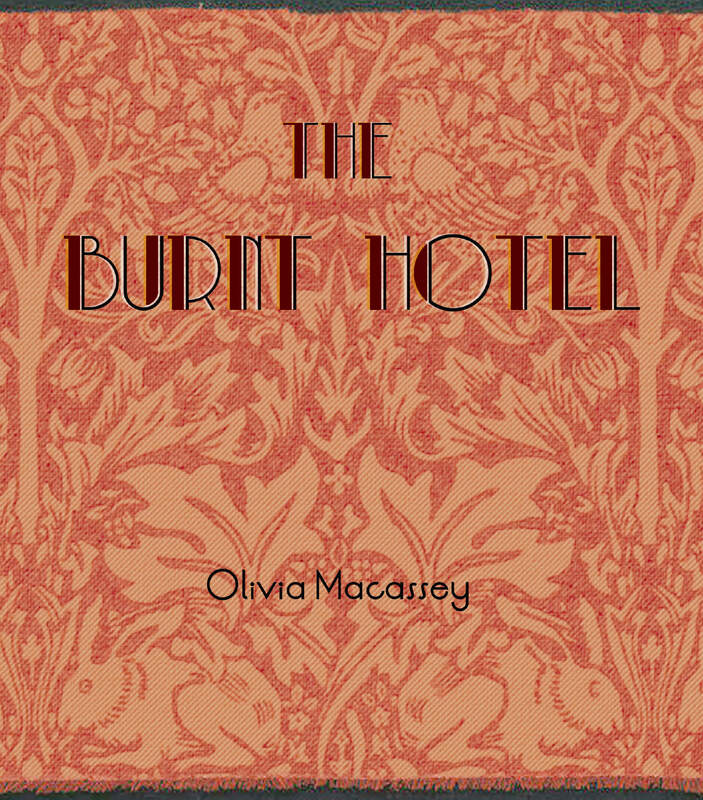 The Burnt Hotel is her second collection. A lovely cover reminiscent of 1930s fading splendour, murder or mystery novels, fairy tale illustrations, and also, a warmth that comes with considering ordinary things while loving the world, however wryly. The many scenarios and characters in this poetry could represent artful cosmopolitan Tamaki Makaurau Auckland. Individuals with flair, secret identities, keeping talismans and love affair souvenirs hidden away, some with bad sides like the cafe Bogey Man in ‘Dead Skin’ (page 42), or the mother not quite a monster in ‘My beautiful cinderella.’ (Page 31). I wasn’t sure why that title warranted a full-stop, at first, but the emphasis makes a statement of something in fact, rather than hinting at something ideal or unreal. Macassey takes extra care with details. Some characters are simply developed from fairy stories. A wolf, the big bad wolf no less, somewhat startling as soon as he’s mentioned, just as he’s supposed to be. Macassey uses the beast to make us listen. She presents then Cinderella, the wish-she-was princess so many littlies dress up as to accompany their parent these days to the supermarket, trailing tulle and glitter. Only in this poem the magical costume snaps, rips, falls away, and Cinderella steps out of happily ever after into whatever-she-may-imagine. Macassey frees this legendary beauty from the constraints of fantasy, leading her to where she could hold something like control of her own story. The beauty of this poetry appears in carefully chosen language appearing quite artless, seeming natural, in lyrical flights and journeys, surprises, and originality. Poetry does take us beyond the ordinary, often quickly. But also, an extraordinary depth of meaning’s possible with only a few adeptly chosen words. Poetry like Macassey’s offers alternatives too, and therefore strengthens ideas re our freedom to find individual new meanings in old stories, or any notion. Other works in this fine collection regard more everyday wonders, such as in ‘The fish/ the bird’, a walk simply along a street in the city, one of the most fascinating, (still), K Rd, or Karangahape Road. Here Macassey soon turns the pedestrian into a memory of some souvenir, again a transformation, while the day grows more magical simply with shifts of light, varying intensities of colour. Invented characters live here as well, the fish and the bird, while double meanings appear in focus changes, line shifts and broken sentences, playful, floaty, and also hinting at some kind of human confusion we must learn to live with, or struggle with, at least. The voice of the character in the poem experiencing all this is so clear, a little child-like, and refreshingly imaginative, even regarding sombre ideas. Much quick, idiosyncratic humour occasionally in these verses often serves to make the more profoundly disturbing, or touching elements all the more intriguing. When Macassey mentions Fresh Crabs on a sign outside one shop “(much too close to the strip clubs for comfort)” I had to smile. Then that leads on to how older people could be wise after all, and soon to what dangers lurk. Contrast striking, so every word evidences every shift in tone necessary. This poet makes hope, the five senses, memory, and a clever imagination all step along together in a thoroughly human shape. Quite the most pleasing and generous experience. I’d like to see the work boosted to include more extremes in contrast perhaps in future, and at times a very few lines seemed rather too easy, but all in all I kept reading avidly. Virginity is still better than power: it’s doves versus battery hens. All in all Macassey uses language to shift readers into unreal and believable places, a reader moved there may dream upon what’s discovered. She also makes vast or important things disappear in only a few words, reminding us language is also a toy, and play’s serious stuff. It is like a burnt hotel, this collection, as if exploring lovely places we recognise, but only partially, with some ruination, and we cannot linger, must keep on going, carry on and take ourselves with us. Take along also this fine book and read it many times. 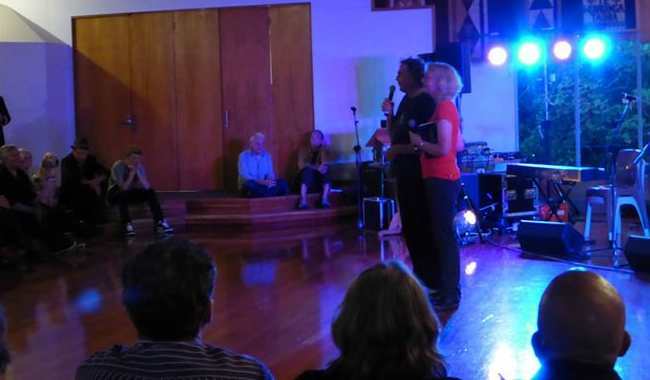 Around 200 people gathered at the Wharekai at the University of Auckland’s Waipapa Marae on Thursday 27th to launch Beyond the Ohlala Mountains. The launch consisted of “bands, performances and readings from the Beyond the Ohlala Mountains. 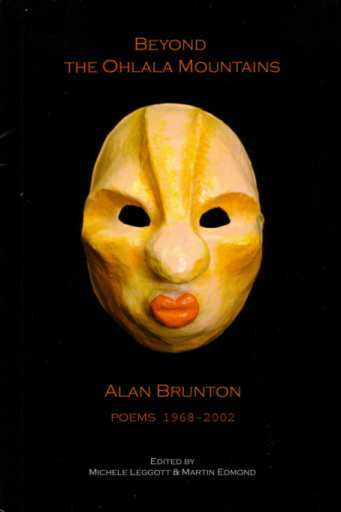 Alan Brunton was an endlessly fertile and eclectic poet, scriptwriter and performer. Born in Christchurch New Zealand, Brunton also worked as an editor, director, performance tutor, literary critic and community arts worker. He was the founding editor of Freed and co-edited the tabloid-format arts magazine Spleen. With his partner Sally Rodwell, he also established the important experimental theatre group Red Mole. Brunton was the University of Canterbury’s Writer in Residence in 1998. He died suddenly in Amsterdam in 2002. Editors Michele Leggott and Martin Edmond speaking at the launch. We set out one fine day in April 2007 to photograph the Red Mole masks in storage at Ohope. Google maps took us flawlessly to Andrew Rodwell’s house above the cliffs. Whakaari (White Island) smoked lazily on the horizon. By early afternoon we were in a big basement opening boxes and lifting out masks, puppets and painted figurines. Caterina de Nave laid them on a table and kept a list; Tim Page photographed each one; Michele Leggott repacked. Most but not all of the pieces were from recent years. The house in Island Bay, Wellington, nearly always had masks in progress drying in the sun on the windowseat. It was also full of masks from older shows and from travels in Asia, Europe and North America. As the unpacking continued we recalled the walls of the house, the shows and who made a particular puppet or wore a certain mask. There were many gaps and the people who might have told us what we didn’t know were not there. The talk turned again to the death of Sally Rodwell six months earlier. It was this painful event that terminated the mask-making in Island Bay and put Red Mole’s journeying on hold. After the sudden death of poet and beloved partner Alan Brunton in 2002, Sally kept herself and daughter Ruby busy with new shows and publishing Alan’s work. But she could not beat the despair that took hold in Alan’s absence and her suicide 15 October 2006 was a moment of disintegration all the more shocking because it seemed to fulfill a pattern imagined so often by Alan and played out many times in his poetry and scripts. Against the hot energy of love and its multiple projects comes inevitable fission, an explosion followed by icy darkness and inertia where a survivor might sleepwalk but not exist in any meaningful sense of the word. We listed and photographed, not sure how any of it would help Ruby, then far away in New York. The mass of Alan and Sally’s papers had gone to the University of Auckland library for safekeeping; the house was rented out and Sally’s brothers were looking after the books and masks until they were needed again. 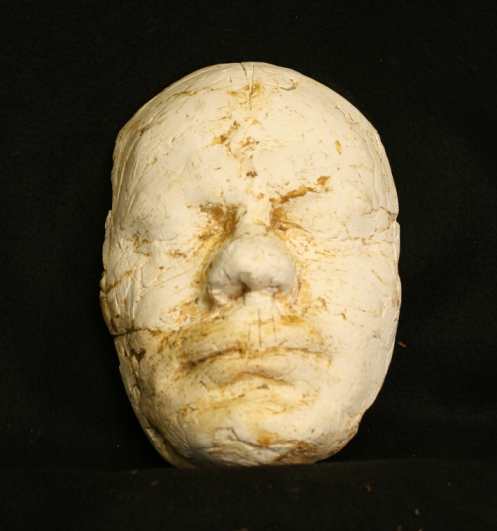 At Ohope we unwrapped almost a hundred pieces, and then there was a plaster of Paris face, familiar features moulded in white, eyes closed, mouth set. It was Alan, a mask or the mould for a mask. None of us had seen it before. This recording of Lana Brunton reading ‘Waves’ was played at the launch.